I grew up eating fish whole, on the bone. Small fish, like tilapia or galunggong (mackarel scad), simply fried and eaten with soy sauce or vinegar. Bigger fish, like lapu lapu (grouper) or apahap (sea bass), baked or steamed for special occasions. Oh sure, we also had fish in fillets and steaks (fillets I like, but I mysteriously cannot abide by steak cut fish), but there was something special about having a whole fish. To this day I prefer whole fish over fillets and other cuts. I love the simple perfection of a fish rubbed with salt and then fried exactly right, the outside and edges crisp, the inside tender and moist, eaten hot and with my hands. Maybe with a dipping sauce of vinegar with just a touch of soy and some crushed bird’s eye chilies…or maybe not. I work through it precisely but slowly, savoring every bite, missing nothing. When I’m done there is nothing left but a pile of clean bones that not even a skilled cat could get more out of. – Line a bamboo steamer with parchment so it comes up over the sides. Line the parchment with the onion slices, some ginger slices, and one slice of lemon. Lay your fish on top of these aromatics. Stuff the inside of the fish (inside the belly as well as inside the head) with most of the remaining ginger and lemon, lemongrass, some of the leeks, a few stalks of cilantro, and cilantro root. Top the fish with any ginger and lemon you have left, the rest of the leeks, and the most of the cilantro (saving a few stalks to garnish fresh once the fish is cooked). Top everything with the soy sauce, fish sauce, and sesame oil. I’ve made the amounts above flexible as this really depends on your taste and the size of your fish. 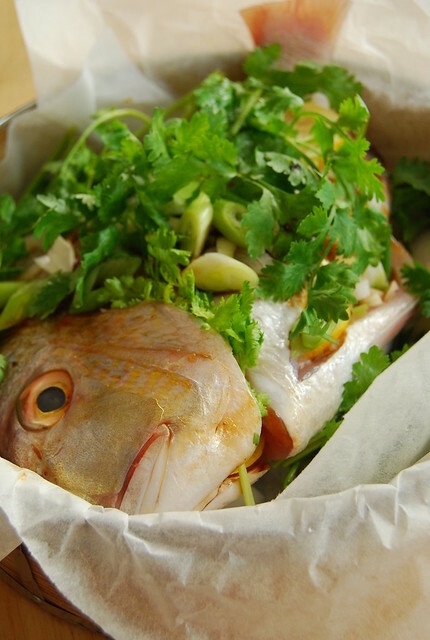 Fold sides of parchment over the fish – it doesn’t have to cover it completely – and cover. – While you are arranging your fish, fill a wok with enough water not to touch the steamer when you lay it inside. Cover and bring to a boil, then lower to a fast simmer. – When the fish is ready and the water in the wok is at a fast simmer, carefully place steamer on the wok. – Steam fish for about 20 minutes. You may need more or less time depending on the size of your fish so check for doneness before taking it off the heat. Simply open the steamer (carefully! Steam burns! ), and insert a small knife into the fleshiest part of the fish – if it flakes easily it’s done. – Turn of the heat and remove the bamboo steamer from the wok – do this carefully with your hands protected as very hot steam will escape when you lift the steamer from the wok. Place the steamer on a plate and serve directly! Tear the remaining cilantro over the newly cooked fish. This is my basic framework for our favorite Asian-style steamed fish. 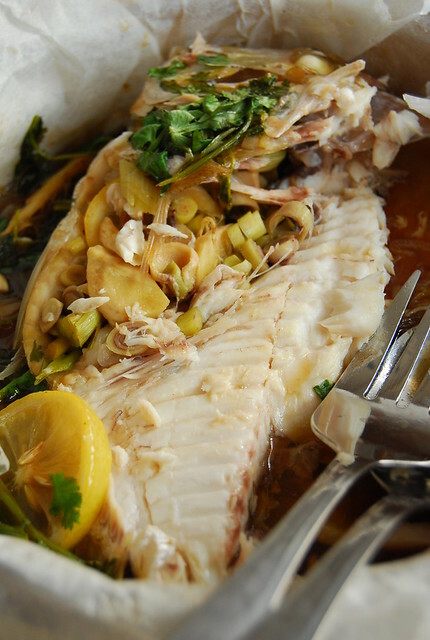 The fish stays moist and the aromatics infuse it with their crisp, fresh flavors. The soy, fish sauce, and sesame oil pool below the fish where the onions have gone all melty to make a delicious sauce. This recipe is adaptable and forgiving. Add, take away, or replace some of the herbs as you like (not everyone is a cilantro junkie like me I suppose) or as available (I’m going to try a version with Kaffir lime leaves and Thai basil next!). Use your favorite fish or try a new one from the market. Fillets would work here as well, although I implore you to try this with fresh whole fish as there is really nothing quite like it! I love cilantro and I wouldn't change anything in your recipe. Although I have a similar steamed fish recipe but over here in the US i use golden pampano.. hopefully I will post it soon. Wow this looks so good. I was drooling while reading. Perfect, healthy and delicious! Love it. I LOVE steamed whole fish. I made a similar dish recently with snapper and it just transported me back home. I agree, there is nothing like it. I saw Kylie Kwong do one also last night and she use Shaoxing (sp?) wine too. Must try soon! This recipe is pretty much along the lines of how my mum steamed fish for my brother and I when we were tots… we sure could put away a lot of this! Hi Jo – such simple presentation but I can tell it's packed with flavour. I think we eat fish the same way – I also like to make "simot" (spell?) the whole fish. Hi Malou! We always love to have cilantro on hand for dishes like this or even just to toss with some tomatoes for salad 🙂 Is golden pampano similar to maliputo? If so that is my favorite fish to prepare this way! Hi Mireille! Isn't really so sarap? 🙂 I have Shaoxing wine and will try it with a splash of that next time! That first is just a WOW photo! Second one is excellent but the first I love. I'll have mine with cilantro please. This looks absolutely delicious, not to mention healthy! This is pretty much how I steam my fish, too! Such a versatile dish, isn’t it? i'm always been a reader of your blog since i stumbled upon it from a foodie link. you have that mommy glow and little C is oh-so-cute. I should start eating more fish! This looks too good! Oh, it's been so long since I've had fried fish (with piping hot white rice, of course) and garlic and chile-studded toyomansi. And yes, yes, eaten with hands! Hi The French! I hope you give it a try…it is not as hard as it looks and you can have your fishmonger gut and scale the fish for you 🙂 And the flavor is really great! Hi Tanna! Thanks…I had a good model 😉 Another cilantro lover…yay! Hi Anh! Yes, so versatile…another thing I love about this dish! Hi Wizzy! That sounds so good! We also have something similar for breakfast here…fried salted or dried fish…I love it! Hi Anne! Thanks for leaving a nice comment and I’m happy to hear you are enjoying my blog 🙂 Ah! You saw my feature in Yummy I see 🙂 Thank you for your kind words! Hi Ash! We love fish over here 🙂 Yummy and good for you! Hi TS! There is really nothing like going over a warm, crispy-fried fish with your hands…the only way to go! Hi Midge! Thanks for the suggestion…will keep that in mind! This is wonderful. I love how steamed fish is so forgiving (in that as long as there's enough aromatics to give it some flavor, and "liquids" (oil, wine etc.) to keep it moist, you're good to go. I came across a recipe which said "add butter and chopped chili peppers" and I did (though as a precaution I used salted butter) and it came out so good! Hahaha! Susan! That is too funny! I have been roasting , steaming whole fish the whole summer. I've never steamed a fish before, but you make it look so tasty and easy! Same sentiments about fish here. I want my fish whole and not some anonymously white filet of something. By the way, I was assigned to work in Afghanistan for a year and was deprived of seeing your blog's photos. I can access your blog but without the pictures it is not just the same. Now that I'm back in the Philippines I can indulge in your excellent food photography again. On a sad note, Marketman just posted his last blog entry and there goes my wish of another Cebu eyeball in the near future. I miss eating steamed lapu-lapu. Thanks for sharing this recipe. ; a blog devoted to showing the work of artists who also love to cook. Hi Lee! Afghanistan! Wow! Glad you are enjoying the photos now 🙂 You flatter me! Sad about MM…yes would have liked another Cebu/Lechon eyeball! I guess it’s time to scour his archives! Hi Andrea! You’re welcome! Lapu lapu is the best…but a bit pricey 😉 But we do indulge ourselves every once in a while! Thanks for the link…the illustrations are adorable!